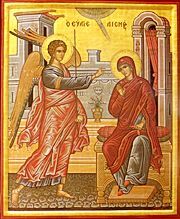 Kyriopascha ("The Lord's Pascha") is the rare concurrence of the Great Feast of the Annunciation (March 25) with Pascha. It is an especially festive event, including complex rubrics for its liturgical celebration. On Kyriopascha, the polyeleos normally appointed for the Annunciation is omitted, the canon of Annunciation is sung together with the Paschal canon during Orthros, and the Gospel of the Annunciation is read after the sixth ode of the canon. 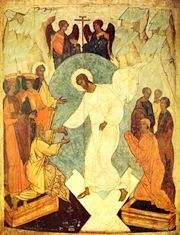 On the remaining days of Bright Week the usual Paschal services for these days are performed in combination with the service for the Annunciation: the litia and artoklasia at Vespers, and the polyeleos, megalynarion, and Gospel reading at Orthros. Because of the difference between the astronomical vernal equinox and the theoretical vernal equinox calculated by the Julian Calendar—the latter of which is used by both the Julian Calendar and the Revised Julian Calendar to calculate Pascha—Kyriopascha never occurs on the Revised Julian Calendar, while it can occur on the Julian. It can also occur on the Gregorian Calendar, however, which uses the astronomical vernal equinox to calculate the date of Pascha. As such, Kyriopascha can be celebrated by the Old Calendar churches and those New Calendar churches which use the Gregorian Calendar (i.e., Finland and Estonia). The elimination of Kyriopascha from the cycle of the Revised Julian Calendar is one of the criticisms leveled against those who use that reckoning. The last Kyriopascha on the Julian calendar was in 1991, which was the year of the collapse of the Soviet Union. The next will be in 2075, 2086 and 2159. The last Kyriopascha on the Gregorian Calendar was in 1951, and the next will be in 2035, 2046 and 2103. There has as yet been no single year in which Kyriopascha was celebrated on both the Julian and Gregorian Calendars, though 232 would have been such a year had the two methods of calculation been in use at that time. The first year in which there will be a Kyriopascha on both the Gregorian and Julian Calendars is 6700, followed by 6779 and 6863. This page was last edited on April 19, 2016, at 16:05.